Old-style meets the nouvelle vague with work from Atelier Marge and Long-Type. 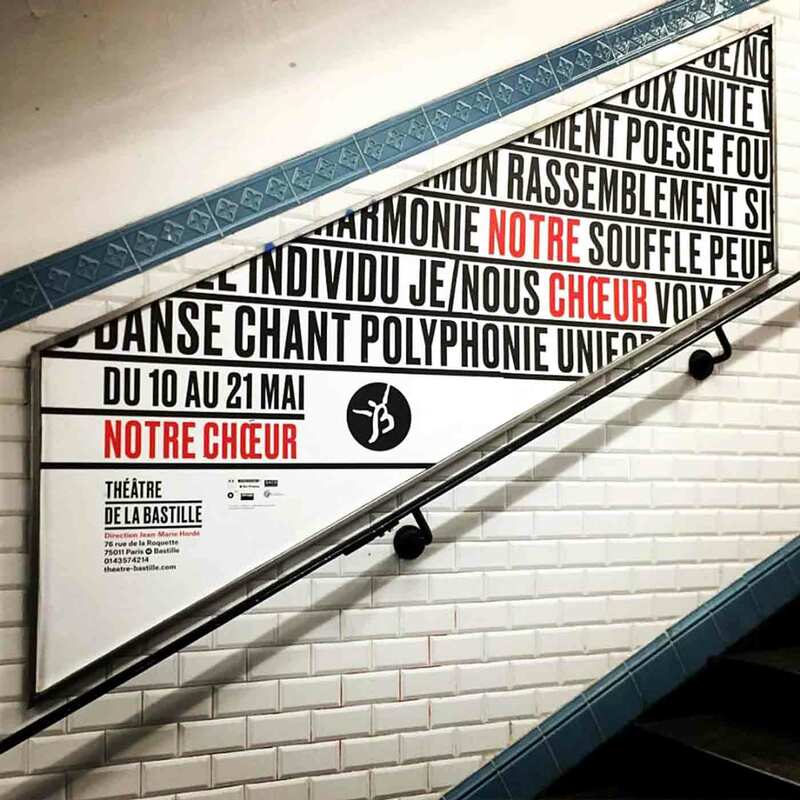 The quote is translated from an impassioned editorial written by Hordé in April, which gave Atelier Marge all they needed to craft the strikingly original collateral for the trend-setting Parisian theater. 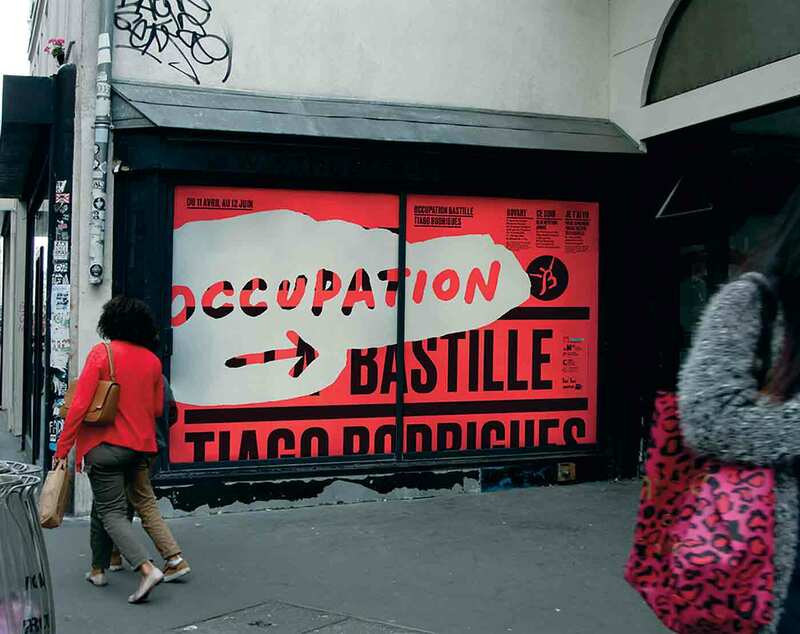 Their designs employ the idea of fragmentation, cutting together shards of red, black, and white to create attractive and surprising mosaics for posters, banners, programs, and more. 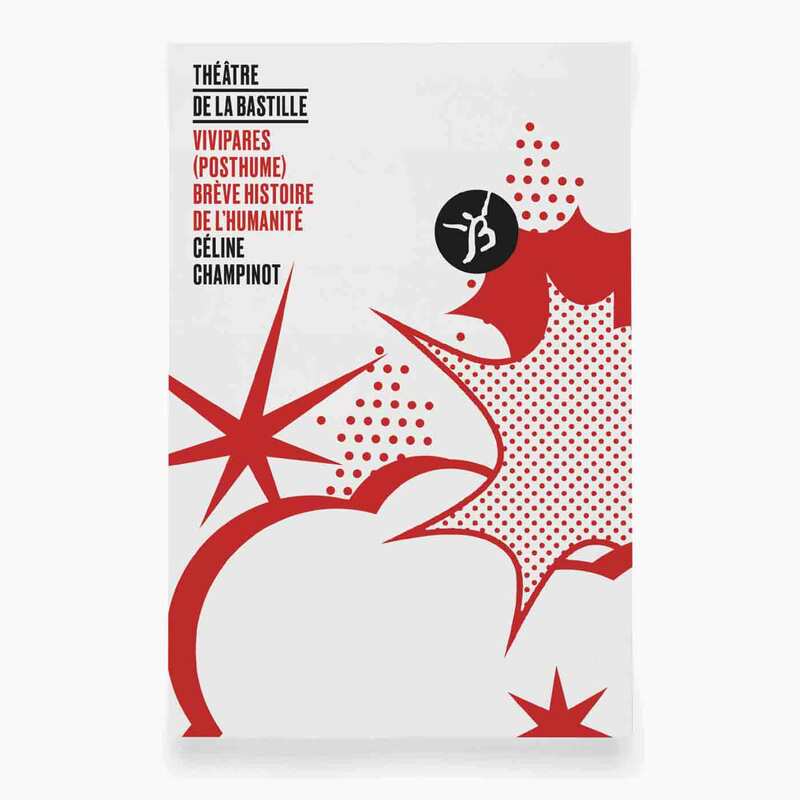 The theater, which has lived as a cinema and varieties theater at various times through its long history, began operating under the name Théâtre de la Bastille in 1982 and came under the leadership of Hordé in 1989. In the near-30 years since, the Hordé has set the two-room theater apart as an international leader in both dance and theatre. The gravity of designing for such a landmark was not lost on Atelier Marge, which claims it would be “rude” to infer that their designs have had an impact on the theater’s position. Posters with torn, fragmented words and chiseled graphic elements express urgency—leaving room for interpretation and the contradictions they raise. They create a demanding visual language which prolongs, emphasizes and questions. To build the typographic palette, Atelier Marge collaborated with its enduring partner LongType, a firm which develops fonts exclusively for “real-life graphic design projects.” The resulting designs juxtapose two styles: early Modernist typography and Dadaist collages. Typographic, textural collages, reminiscent of Kurt Schwitters in form but not color, draw the pedestrian’s eye and echo another line from Hordé’s editorial: “Faces are lost, words and images blur.” These loud and often dense graphics appear to move and fall in place—exactly the kind of effect needed on crowded walls in Paris. The color scheme, frequent horizontal rules, bold sans-serif type, flush left treatment, and use of all-caps harken back to 1920’s modernist typography à la Jan Tschichold. Considering the similar style and subject matter, Tschichold’s “Musik der Zeit, Wort der Zeit, Tanz der Zeit” poster could have been an inspiration for Atelier Marge. Work on this level is something the performing arts industries have begun to expect from Atelier Marge. In recent years, the firm has produced impressive designs for opera houses, festivals, orchestras, and theaters, among others. Atelier Marge’s work stands out by its use of type as texture or object. 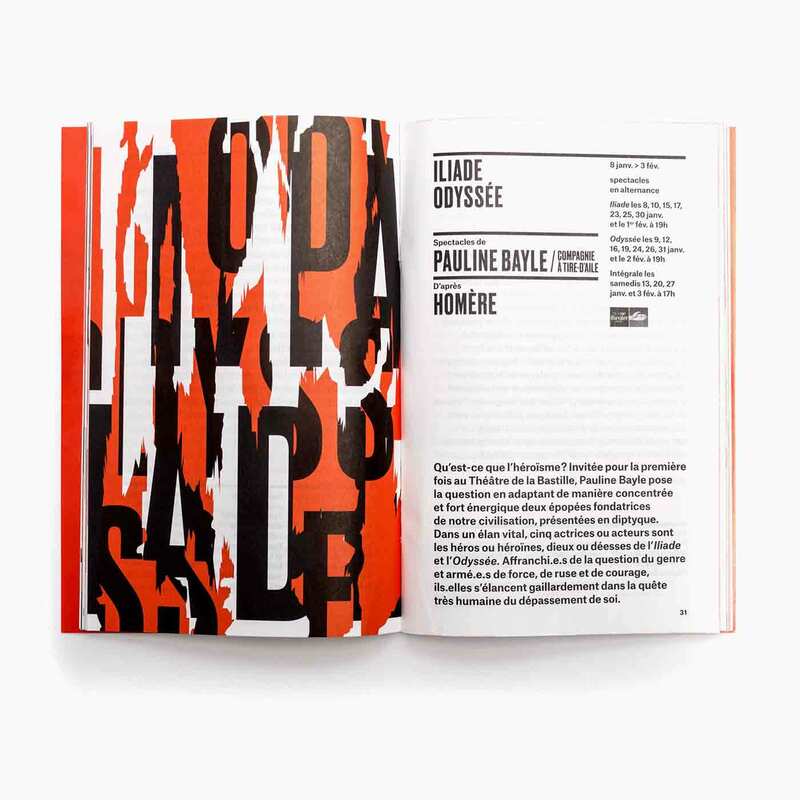 With the typographic collages for Théâtre de la Bastille, Atelier Marge brings type to life through scale and color, often creating work with no purely graphical elements. Just as often, they will create compositions entirely composed of photographs. This mix of styles keeps their designs fresh in a field where other studios might go stale after the third theater or second opera house.